There are a number of gentians that flower in the Rocky Mountain area of America and this is one of the most robust, growing to a height of around 14 inches. Each of several flower spikes can carry up to 3 large, goblet-shaped flowers which have green stripes on the outside of the petals which form tubes. When the flowers are open this plant is a stunning sight in the damp meadows of the Rockies. It is particularly fond of stream banks which is where we mainly found it in Rocky Mountain National Park. 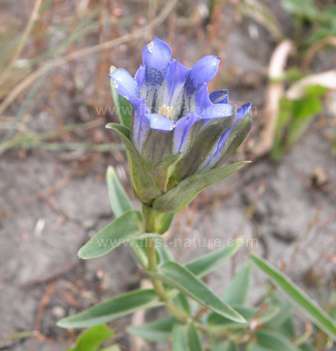 The Mountain Gentian flowers in late summer - July onwards and well into autumn. The specimen on this page was photographed in the western zone of Rocky Mountain National Park in late August .